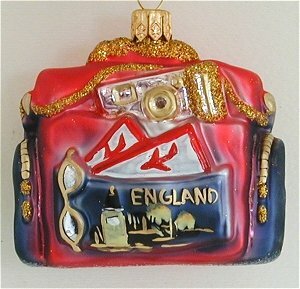 Another page of beautiful blown glass ornaments from Europe with a British theme. 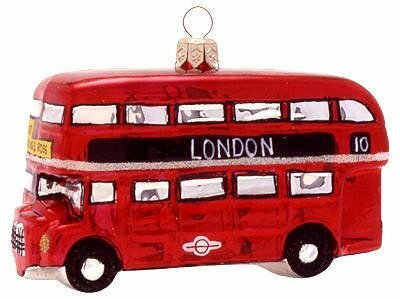 This beautiful blown glass ornament features a London Bus with the iconic images of London on top of it. 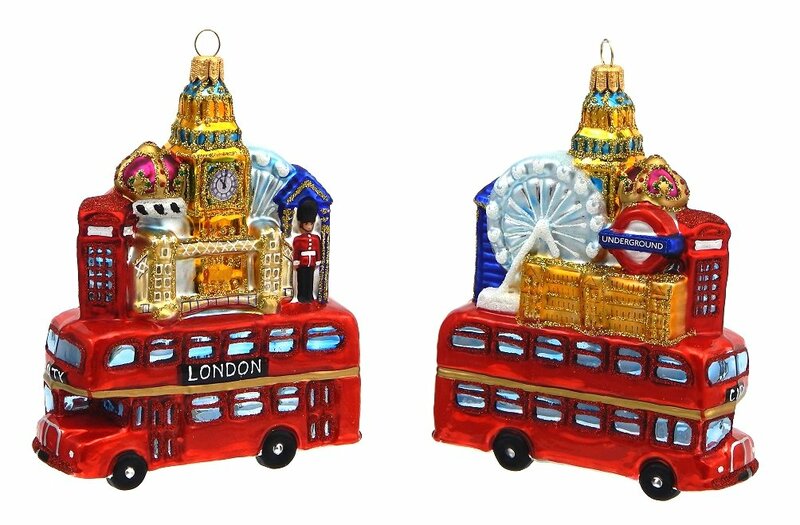 A red phone box , the crown jewels, Big Ben, Queens guard, Tower Bridge, London Eye, Buckingham Palace and the ever present London Underground logo. 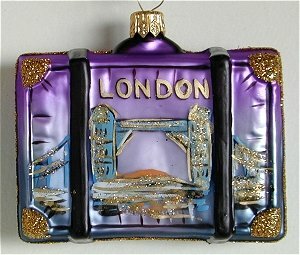 Your memories of London will be complete with this single ornament. 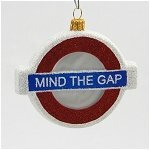 'Mind the gap' is an audible or visual warning phrase issued to rail passengers to take caution while crossing the horizontal, and in some cases vertical, spatial gap between the train door and the station platform in London. 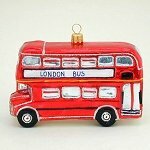 The London Underground is a public rapid transit system serving Greater London and some adjacent parts of the counties of Buckinghamshire, Essex and Hertfordshire in the United Kingdom. If you have ever visited London you will be familiar with the easily recognized Underground logo which marks all the tube stations. 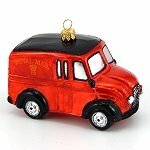 Our blown glass ornament is a double sided design that will remind you of your time in London with Underground on one side and Mind the Gap on the reverse. 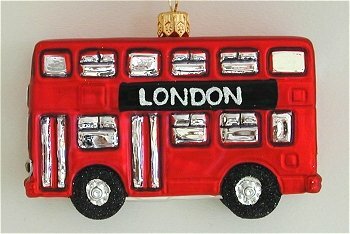 Have a fond memory of a tour of London with this beautiful city tour bus ornament. 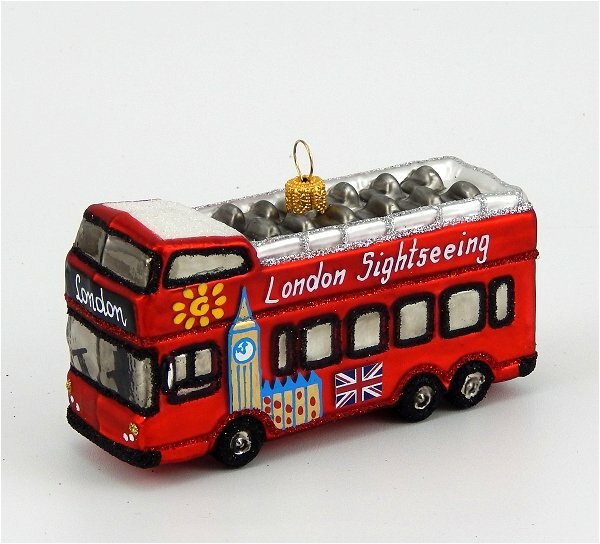 The hop on hop off buses are in many European cities and London has its own group that all end up at Hyde Park and go to all the major attractions from the Tower to Buckingham Palace and Big Ben. This captures the fell quite nicely. 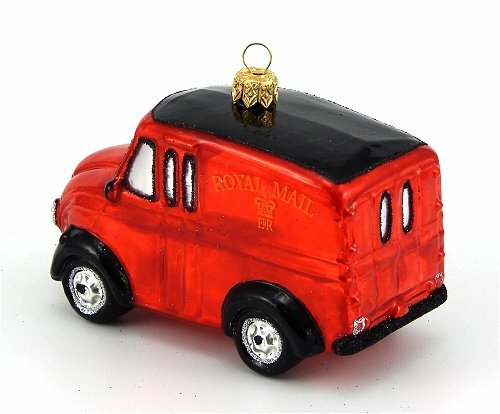 A familiar sight in England this bright mail truck used to deliver twice daily. How times have changed both there and here in the US as well. 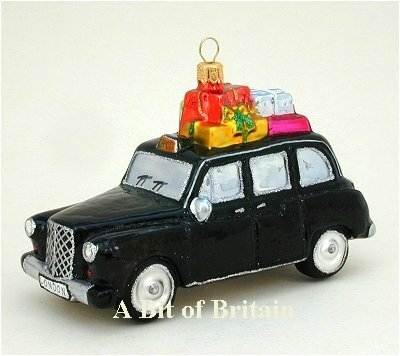 Our London Taxi ornament most closely resembles the Austin FX4, which made its debut in 1958. 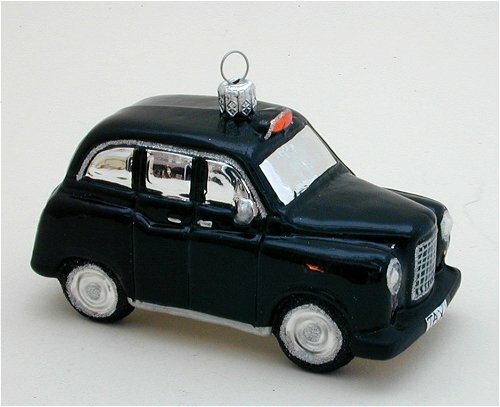 Of the multitude of cabs in operation in London today, this familiar black taxicab has become as much an icon of British automotive culture as the Rolls Royce. 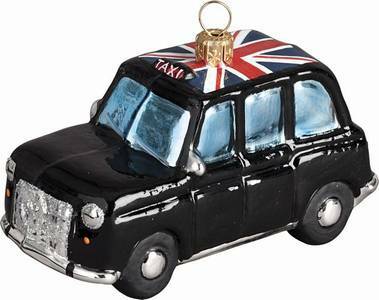 Black London style Taxi with the Union Jack Flag on top. 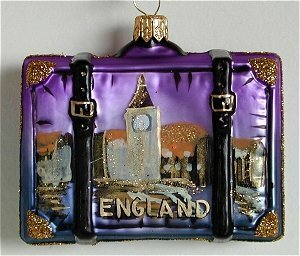 Progress is changing the phone booths, mail boxes and the buses of England. 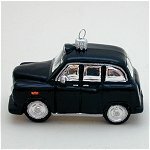 Here in the more modern style in use today. 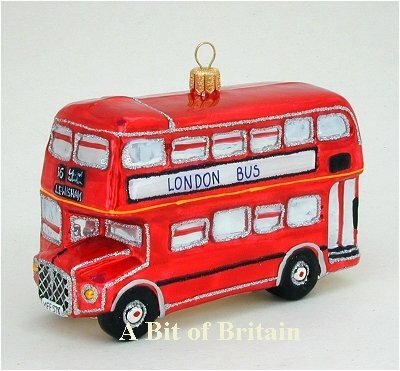 The best way to see London is from the upper deck of a bus. 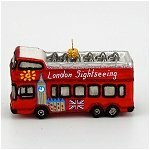 Tour companies even have busses with the roofs removed that leave from Hyde Park and circle the cities best sites. 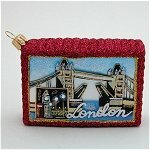 3.75 inches high and beautifully gift boxed. 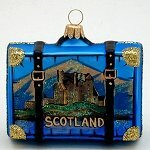 This glass postcard says it all and you can even address it with a felt tip marker ! 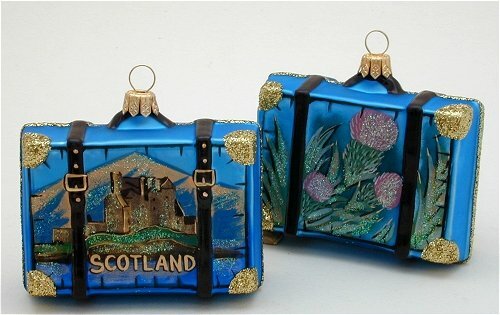 Decorated on both sides this suitcase will bring back memories for any traveler to the UK. 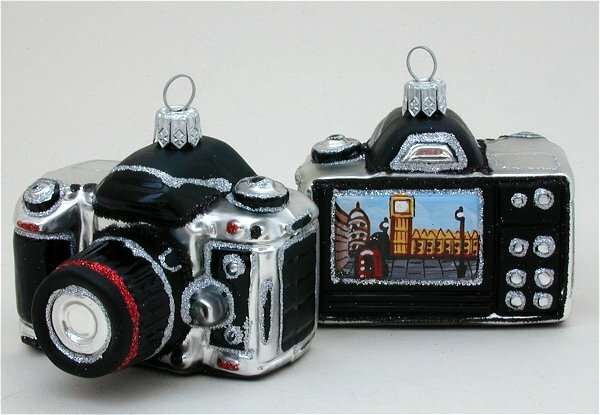 A fun Christmas ornament made to look like a digital camera. 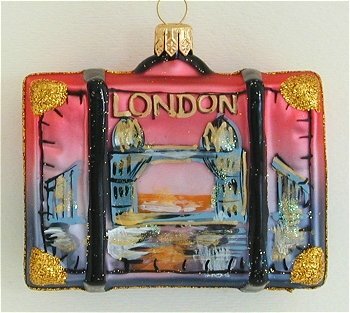 The larger photo shows the back with a painted image of London in the viewfinder. Everyone has had one of these when you travel that tells you what to see and how. 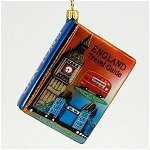 We had an AA Guide when we toured England years ago. 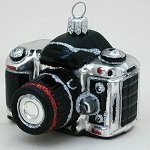 Happy memories for your tree. 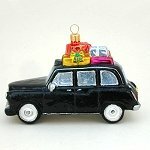 Your bag is packed and overflowing with the preparations for your upcoming trip.